How does aminoacyl-tRNA synthetase recognize different tRNAs? There are about 20 aminoacyl-tRNA synthetases, one for each amino acid. Each aminoacyl-tRNA synthetase has a binding site that recognizes a specific amino acid, and other binding areas that recognize a particular tRNA through unique identity sites at the acceptor stem and/or anticodon loop of the tRNA. When there are different tRNAs for the same amino acid, the aminoacyl-tRNA synthetase that recognizes a specific amino acid must also recognize the set of tRNAs that can be charged with that amino acid. Given that all tRNAs have different anticodons, how does the enzyme achieve the aforementioned task? 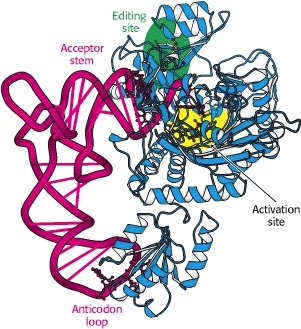 binding areas that recognize a particular tRNA through unique identity sites at the acceptor stem and/or anticodon loop of the tRNA. The point is that aminoacyl-tRNA synthetases that recognize tRNAs with different anticodons have to supplement any partial codon recognition with recognition of common features elsewhere, in particular the anticodon loop. Unfortunately this has evolved on a case-by-case basis and there is no simple ‘code’ one can refer to. As expected, the CCA arm extends into the zinc-containing activation site, where it is well positioned to accept threonine from threonyl adenylate. The enzyme interacts extensively not only with the acceptor stem of the tRNA, but also with the anticodon loop. The interactions with the anticodon loop are particularly revealing. The bases within the sequence CGU of the anticodon each participate in hydrogen bonds with the enzyme; those in which G and U take part appear to be more important because the C can be replaced by G or U with no loss of acylation efficiency. The four codons for Thr are ACN, so in this case recognition of two bases of the anticodon will identify all tRNAs. A diagram from Berg et al. showing the multiple interactions in threonine tRNA-synthatase is shown below. Not the answer you're looking for? 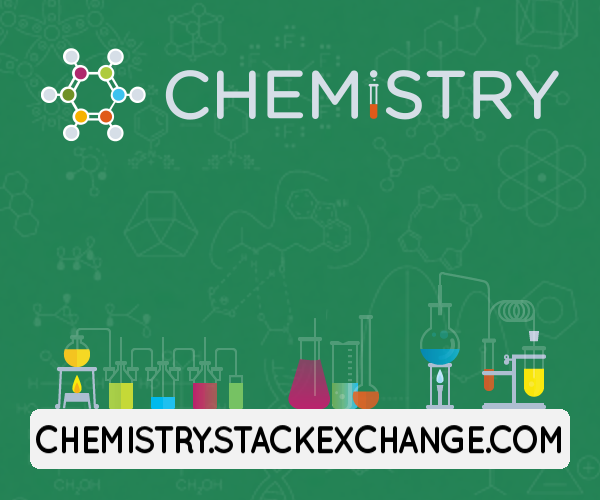 Browse other questions tagged homework molecular-genetics enzymes amino-acids translation or ask your own question. How can DNA profiling be used to determine the number of organisms from a specific species that is within a certain area? How do aminoacyl-tRNA synthases distinguish between similar amino acids? Do tRNAs that recognize multiple codons have any preference for one over another? Why did translation develop a specific codon for initiation?